CBD is being talked about everywhere. With more and more sources reporting the benefits of CBD in supporting health and wellness, comes a lot of myths, confusion, and misinformation. In order to educate the public about CBD, Diamond CBD has launched the “I am CBD, I am THC” video series nationwide. The national CBD educational campaign addresses the confusion surrounding CBD with a “What Is CBD” guide and a humorous video series exploring the facts and myths about CBD and THC. Storytelling is the art of telling a story using sensory language presented in such a way that communicates its listeners the ability to internalize, understand and construct the personal meaning of it. Customers do not buy your product or your service. They buy the emotion that you make them feel and the meaning that it has for them to get something from your brand. A good story creates a positive emotion that inspires people to take an action. In the same way, your brand story should trigger an emotion that inspires a client to buy your idea. Above all, when you tell your story, you show your values, your virtues, and your humanity. You work constantly to achieve an authentic and warm connection with your clients, and little by little you will gain their trust. Diamond CBD differentiates by educating everyone how its presence has a positive impact on the world, and make clients never want a world without them. 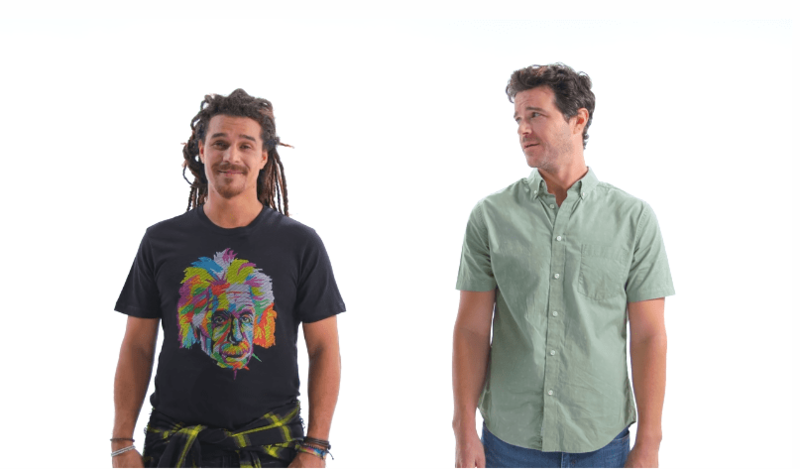 The I am CBD, I am THC Video Series is a mix of humor with nostalgia for a classic ad to achieve their goal of informing the audience about CBD and dispelling the myths about its similarities to THC. In truth, CBD is very different than THC, even though it is not always perceived that way in popular culture. Many people are still confused about whether CBD gets you high or not or whether they need a CBD supplement if they use THC. In order to break through the clutter of misinformation and educate the public in a simple, emotional and true way, about the benefits of CBD along with information detailing how it’s made, used, etc. Diamond CBD launched the Diamond CBD education Center. This serves as a resource for information, news, videos and articles addressing every topic surrounding CBD from where it is made to how it is processed, used and sold. As I mentioned above, Diamond CBD masterfully conveys its message in a simple, emotional and true way. Also, it is credible and valid. Consequently summing 5 basic aspects of good storytelling. Let’s enumerate them one by one and see why it is important. The best things in life are simple; The best ideas are simple and the best design is very simple. Also, the best stories are simple: boy meets girl, a worker in distress, moral conflict or period drama. Stories that are easy to understand because they are based on a language we know: that of human experiences. If it takes a lot of time to understand the story you are creating for your brand, stop and think about how to reduce it to its most elemental essence. You will communicate it faster, as well as helping it to be memorable. Emotional does not mean maudlin or easy. Emotional means that it must contain emotions, such as pain, love or humor (sometimes all three!). Which of these emotions to include? A well-constructed story will probably have all three. If you consider on your own life or the ones from people close to you. You will discover that there are no events in which just one emotion reigns. Surely your audience will appreciate much more real stories than fictional ones. Why? Because the reality is easier to believe and more relatable. It does not have to be current, it can be a tradition or a story that happened many years ago. Like the best business ideas, stories must be scalable, so they must work well from a personal level to a collective one. Interest in the Cannabis industry is exploding. As more and more cannabis-based products make it to the market, the confusion only increases. The “I am CBD, I am THC” video series was commissioned by Diamond CBD to Creative Propulsion Labs, as part of their campaign to educate people on the uses and effects of CBD oil. The first 8 videos in the series are live now for watching. Always remember that a story is not an anecdote. A story is a series of conflicts that lead us to change. The public will tolerate with somehow interesting anecdote, but even more, will never forget a good story.